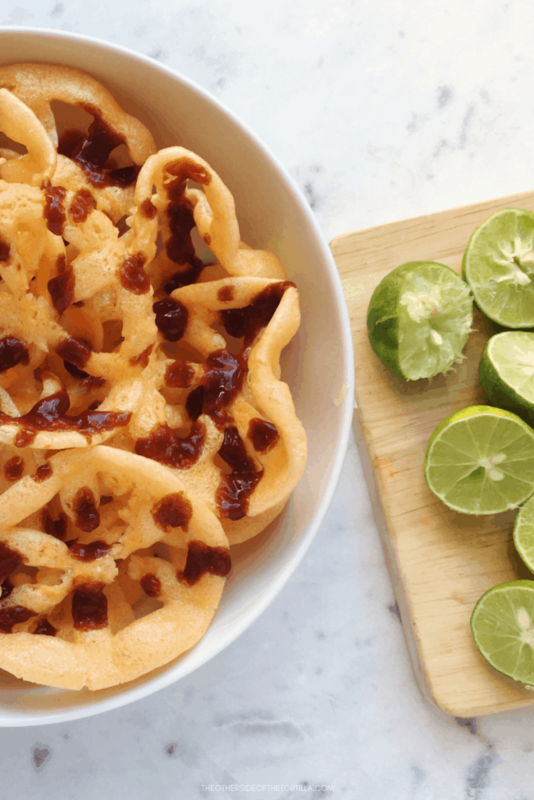 Have you ever wondered how to make your own chicharrones de harina? 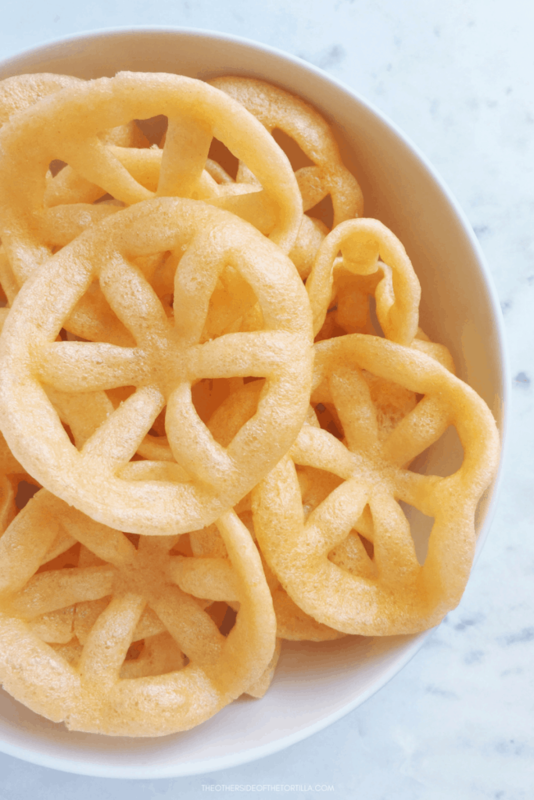 The crunchy, salty and mysteriously orange-colored street food snack eaten with lime juice and drizzles of salsa? 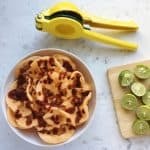 I get a lot of questions from friends and readers about this snack because they’ve never seen it before, or have never prepared it themselves. And although they may look intimidating, they’re extremely easy to make at home. If you’ve been to Mexico you likely have seen street vendors selling this snack alongside real chicharrones (pork rinds) and potato chips. Some have a variety of salsas, while some only carry one or two. But there are always plenty of limes, no matter what. 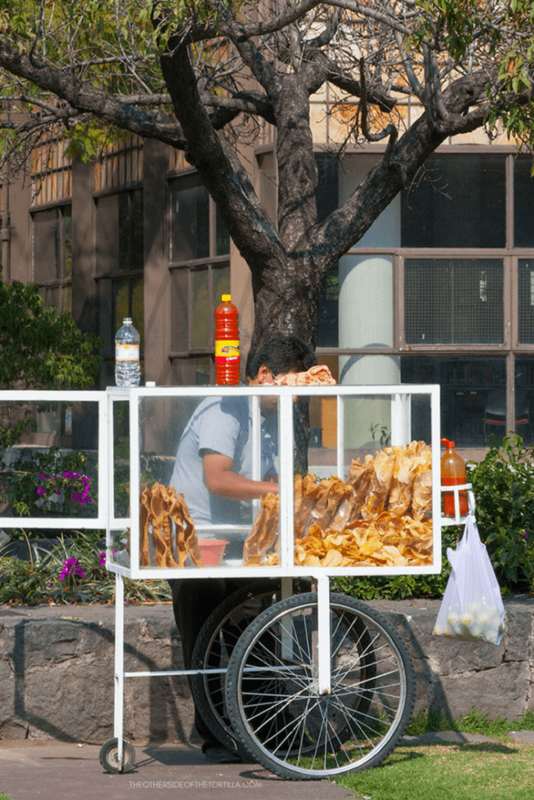 Unless you live in a city with a large Mexican population such as Chicago or LA, it’s unlikely that you’ll find any street vendors that carry these snacks in the U.S. 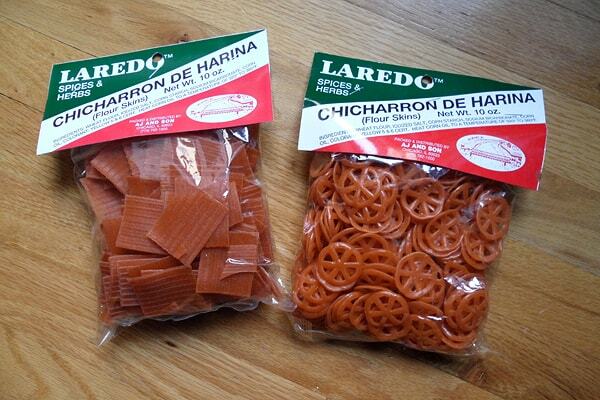 Most Mexican supermarkets carry both the ones you can cook at home, and the ready-to-eat version. I’ve included a quick video below on how to fry them. Over the years, I’ve evolved my method and now use a 6-quart enameled dutch oven I bought on Amazon that’s just as good as the more expensive brands. This way I can add more oil to the pot and prevent splatter. 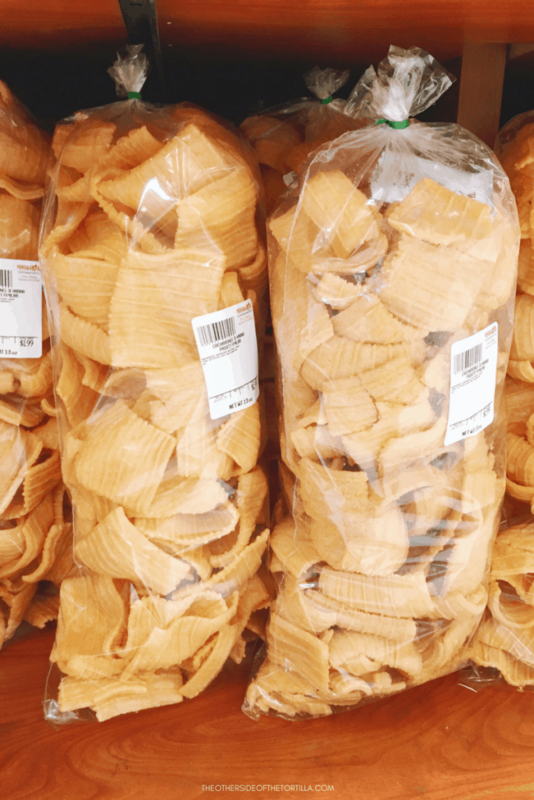 Although I used the ones that look like wheels, another common shape you’ll find are the ridged rectangles or squares, that look more like actual chicharron. How to make the popular Mexican street food snack known as chicharrones de harina (fried, puffed wheat snacks). Heat oil in a pan or pot over medium-high heat until hot. Place two chicharrones into the hot oil with a slotted spoon to see if it’s hot enough, and how long they take to puff up completely. Adjust the heat if necessary. Using the slotted spoon, add several more chicharrones at a time to the pot, turning with the spoon to help them puff evenly. When they’re ready to be removed from the hot oil, transfer them with the slotted spoon to a paper-towel lined plate. Pat dry if necessary. Store any leftover chicharrones that have not been covered in lime and salsa in an airtight container or zip top bag. They’ll last a few days before they start to go stale. 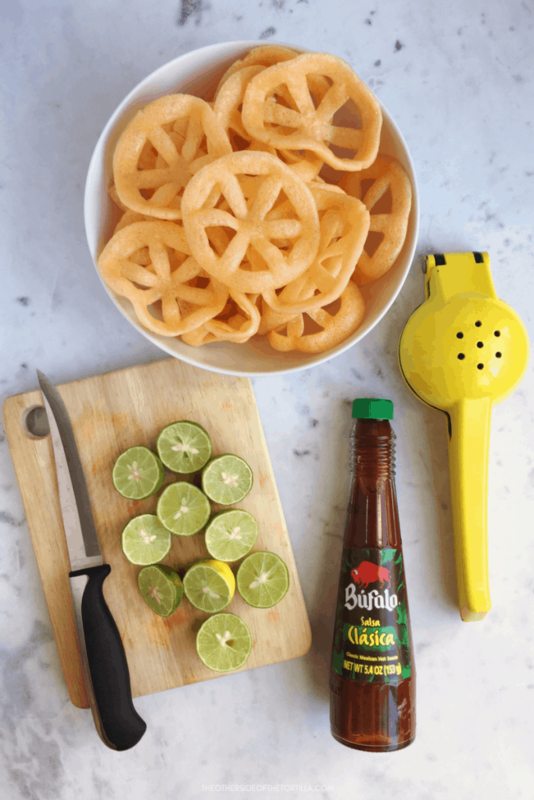 Advice on dressing your chicharrones: Working quickly, squeeze lime juice over the chicharrones and then add salsa and serve. The lime juice sometimes makes them crackle and start to disintegrate, which is normal. I prefer using Mexican limes (key limes) rather than the large limes you typically find in the grocery stores in the U.S., but they’ll do if you can’t get the small ones.